Spices... the word itself causes hunger pangs for us! Apart from adding taste to the foods we eat, spices also have many health benefits. Each spice has its own specialty. Let us quickly look at the benefits of some of the spices which are regularly used in Indian cooking. 1. Turmeric: It is being used for its antiseptic properties since ancient times. It also acts as an anti inflammatory agent. It contains antioxidant activity, so it's a magical spice with bright yellow colour. 2. Hing (Asafoetida): It is known to relieve flatulence (gas) and so is included in almost all the Indian recipes with tadka. It can also help patients with dry cough as it acts an expectorant. 3. Cumin seeds: Since a very long time, cumin seeds are known to enhance the digestion of foods. It also has a soothing effect on the GI tract. It is used to reduce nausea during pregnancy. It might help to overcome insomnia. 4. Mustard seeds: This tiny seed is known to improve digestion and increase the motility of GI tract. It contains a lot of phytonutrients and hence may play a protective role against Cancer. It is a good source of nutrients like selenium and magnesium. 5. Cloves: This has many health benefits. It has anti inflammatory, anti analgesic (pain relief), anti fungal and anti septic properties. It is also useful in treating nausea. 6. Cinnamon: This spice is used as a home remedy to treat indigestion, gas/flatulence, or stomach upset. It also has anti microbial properties, which prevents food spoilage. Indian spices have a very strong blend of a number of health benefits. 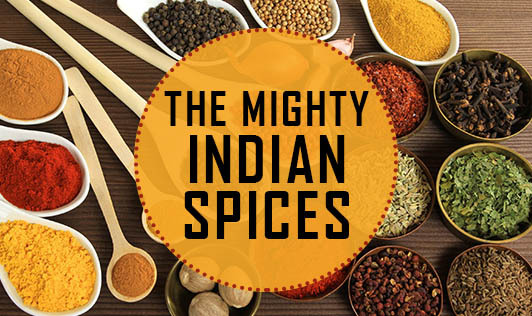 Each spice adds a unique taste to our food, make good use of these mighty spices!